A simple red clown nose. That was all that Martha Márquez needed to transform a sick child’s hospital room into a place of imagination, inspiration and hope. Years ago, while working as a “Doctor of Laughter” with Risaterapia in Tijuana, Martha and other volunteers would put on red clown noses and pay visits to sick patients, aiming to bring some levity and joy to what could often be a challenging environment. While she no longer wears the red nose, she keeps it tucked away and its essence seems to have worked its way into Martha’s current work as Executive Director of Philanthropiece A.C., in B.C.S. Mexico. In her ED role, she uses her warmth, her wisdom and her professional experience to lead the community savings groups and financial education programs in new directions. Martha has a dynamic educational background, receiving both her undergraduate and master’s degrees from Ibero-American University in Tijuana, which is a Jesuit university. The teachings of the Jesuits helped to shape the way Martha thinks about the world and the people in it. At the Ibero-American University, Martha received her undergraduate degree in Organizational Communication and her master’s degree in Human Development. For her PhD, which she received from the Autonomous University of Baja California Sur, she studied Social Sciences with a focus on Sustainable Development. She sees all of her education as part of a continuum in her desire to understand human beings and how they thrive in the world around them. 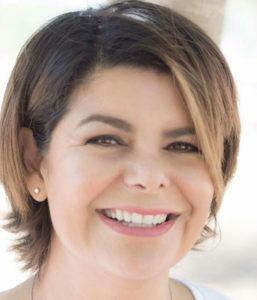 She initially connected with Philanthropiece through her doctoral program, following an internship she did at University of California, Irvine. Several of the UCI students had come to La Paz, Baja and asked Martha to connect them with nonprofit organizations that were doing work in the area. She found Ernesto Vázquez, then Director of Operations for Philanthropiece A.C., and the more she got to know about the work Philanthropiece was doing with community savings groups, the more she realized it related to her own research and relationships in the surrounding communities. Through her work as a volunteer, she met Jake Matlak, Director of Programs for Philanthropiece and Jordan Bailey, Field Coordinator for Philanthropiece. They invited Martha to a promoter training, which helps individuals gain the knowledge to implement the community savings groups program in receptive communities. After becoming a promoter, her natural leadership skills continued to grow and she applied for several staff positions with Philanthropiece, ultimately undertaking the Executive Director position. During that time, the B.C.S. staff also set about forming their own civil association and Martha has helped to facilitate that transition. It has brought about some unique challenges. 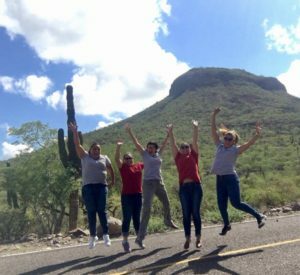 Martha (center) jumps for joy alongside her colleagues from Philanthropiece A.C. in her home region of Comondu, BCS, Mexico. At the heart of her work, Martha always aims to return to her focus on people and their relationships with each other. She sees Philanthropiece as an organization that can assist and grow these relationships within communities. As part of her focus moving forward, she wants to cultivate deeper, more meaningful relationships with each participant in the Philanthropiece A.C. programs. Morning Glory Farr has worked with Philanthropiece for more than nine years, first as a Community Liaison in Mexico and Guatemala, and later as a dedicated Advisory Board member. She currently serves as the foundation’s Content Manager and Editor, and excels at holding interviews in Spanglish.